Yesterday was quite the day in Electronic music as the premium brand for Electronic events, Resident Advisor, broke the news about the 7th Annual Brooklyn Electronic Music Festival Lineup coming this November! As you can imagine when a multi-venue festival of this magnitude, which includes venues such as Output Panther Room, Williamsburg Music Hall, Verboten, Cameo Gallery, Villain, Kinfolk, Baby’s All Right, and Glasslands, we were primed to report the great news! You can grab yourself 2-Day passes for GA for $120 or get yourself a 2-Day VIP experience for only $175! Another added bonus comes from Machinedrum, who will be performing at the Festival. He has given out an exclusive mix to hype up this massive event coming our way in just over a months time! 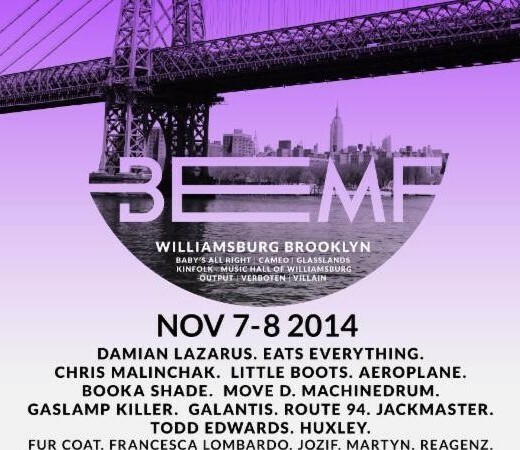 See below and enjoy some great music with some even greater excitement coming for Brooklyn Electronic Music Festival!